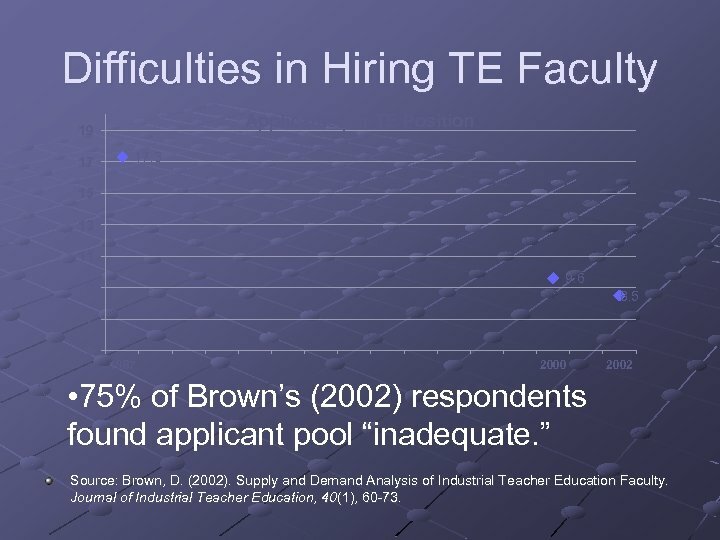 Difficulties in Hiring TE Faculty 38% TE Faculty Search Failure Rate 36% 34% 32% 30% 28% 27% 26% 24% 22% 20% 1997 -1998 -1999 2000 -2001 Source: Brown, D. (2002). 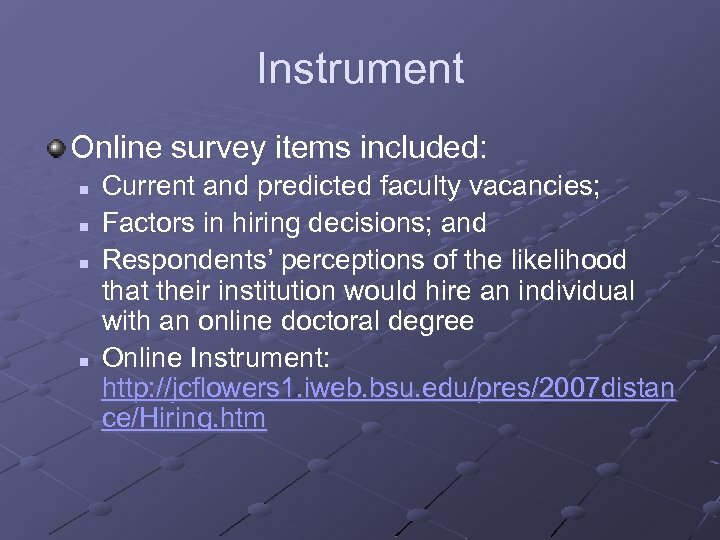 Supply and Demand Analysis of Industrial Teacher Education Faculty. Journal of Industrial Teacher Education, 40(1), 60 -73. 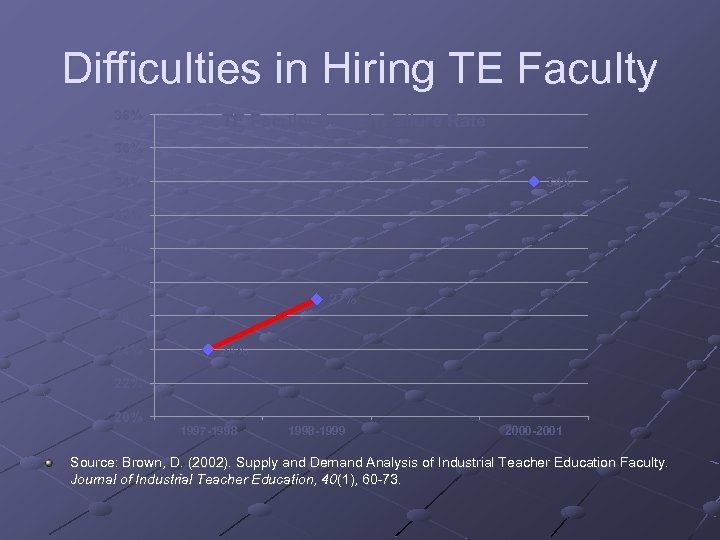 Difficulties in Hiring TE Faculty Applicants per TE Position 19 17 17. 3 15 13 11 9. 6 9 8. 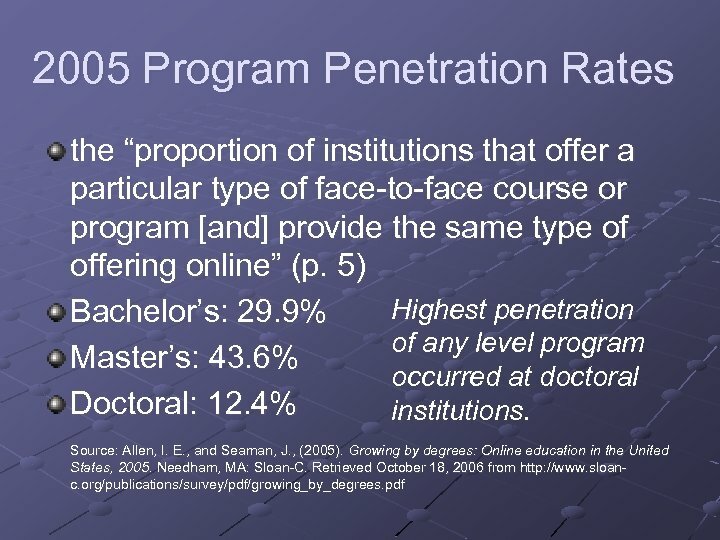 5 7 5 1987 2000 2002 • 75% of Brown’s (2002) respondents found applicant pool “inadequate. 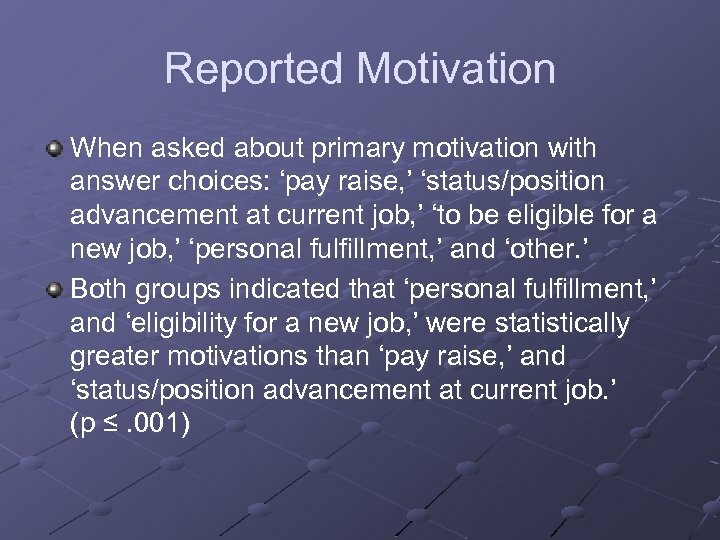 ” Source: Brown, D. (2002). 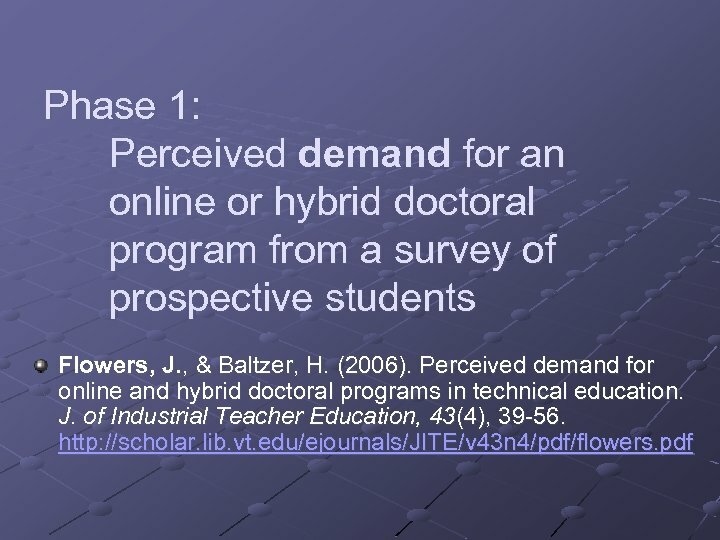 Supply and Demand Analysis of Industrial Teacher Education Faculty. 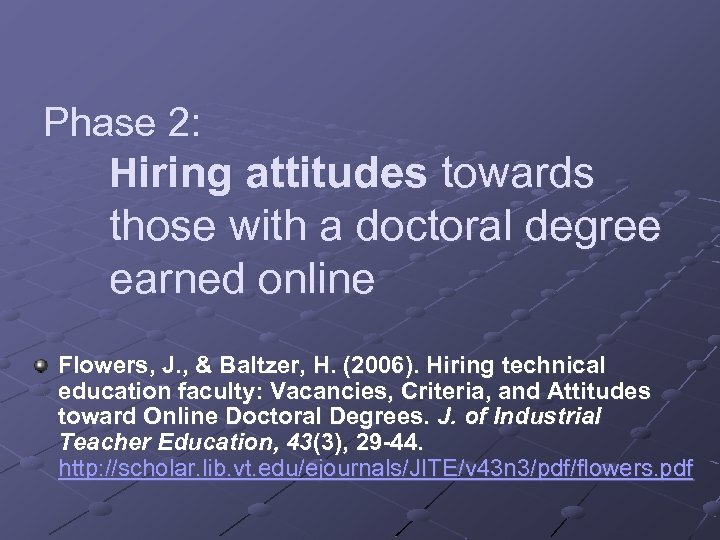 Journal of Industrial Teacher Education, 40(1), 60 -73. 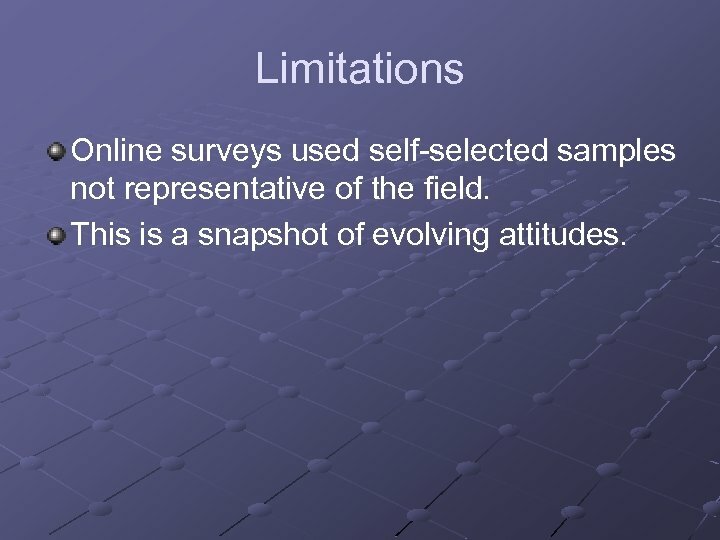 Limitations Online surveys used self-selected samples not representative of the field. 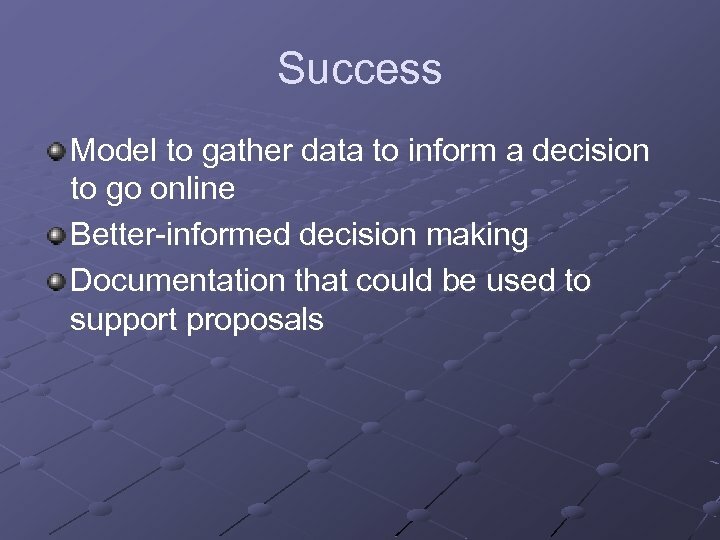 This is a snapshot of evolving attitudes. 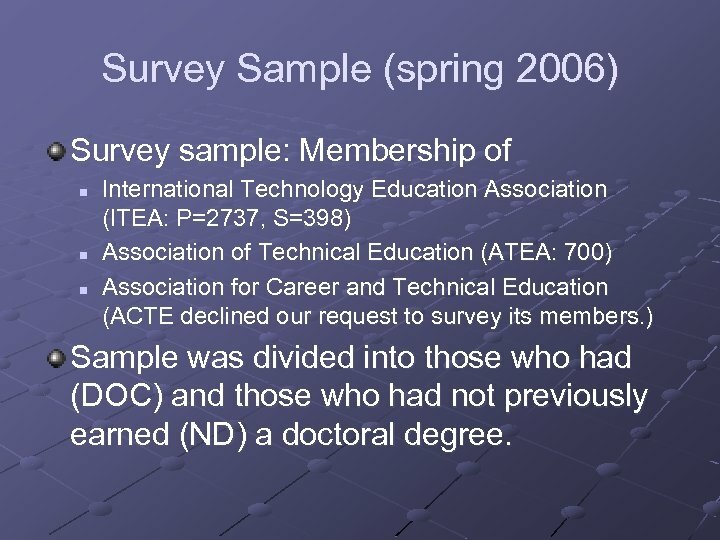 Survey Sample (spring 2006) Survey sample: Membership of n n n International Technology Education Association (ITEA: P=2737, S=398) Association of Technical Education (ATEA: 700) Association for Career and Technical Education (ACTE declined our request to survey its members. ) 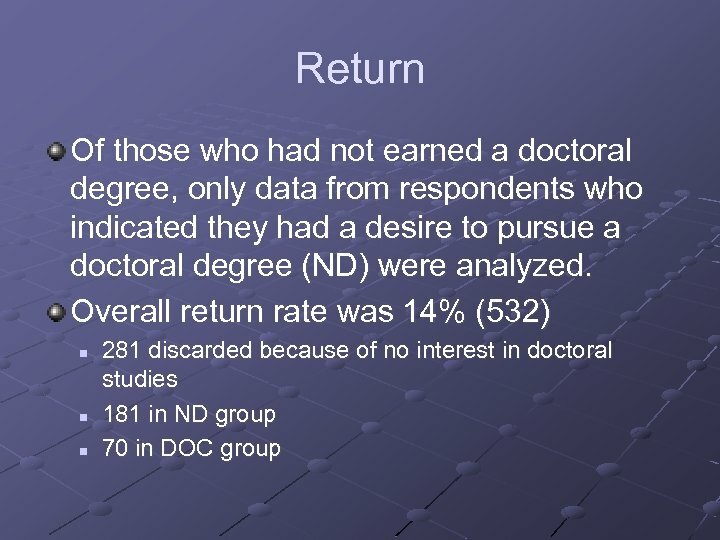 Sample was divided into those who had (DOC) and those who had not previously earned (ND) a doctoral degree. 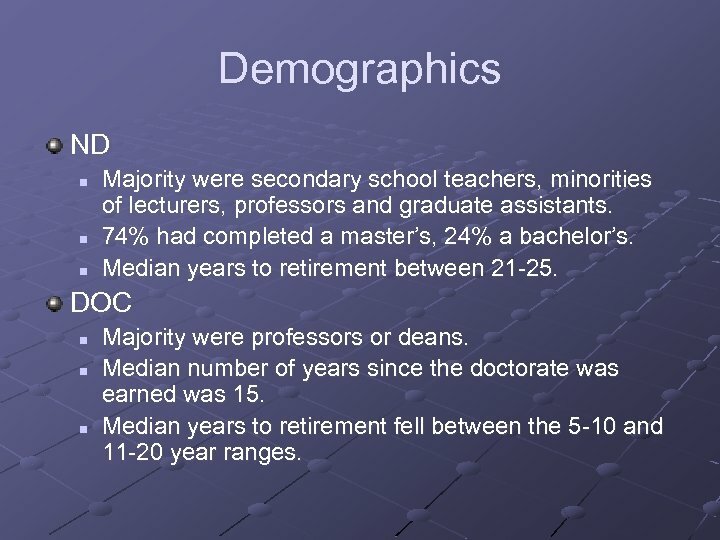 Demographics ND n n n Majority were secondary school teachers, minorities of lecturers, professors and graduate assistants. 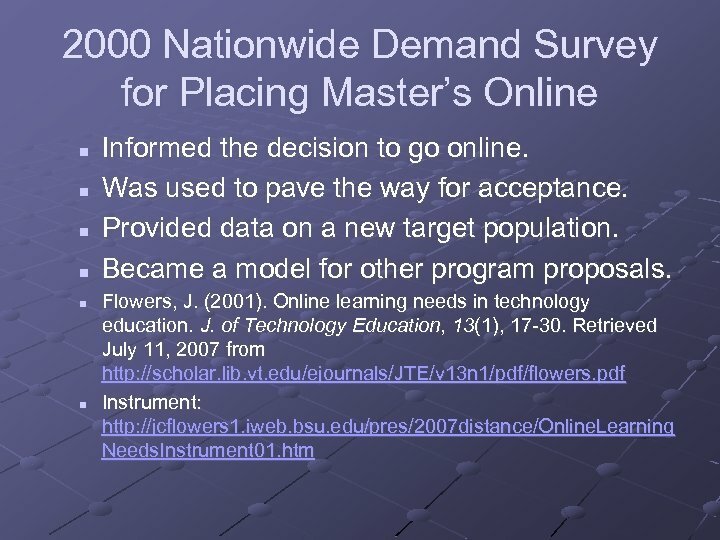 74% had completed a master’s, 24% a bachelor’s. Median years to retirement between 21 -25. 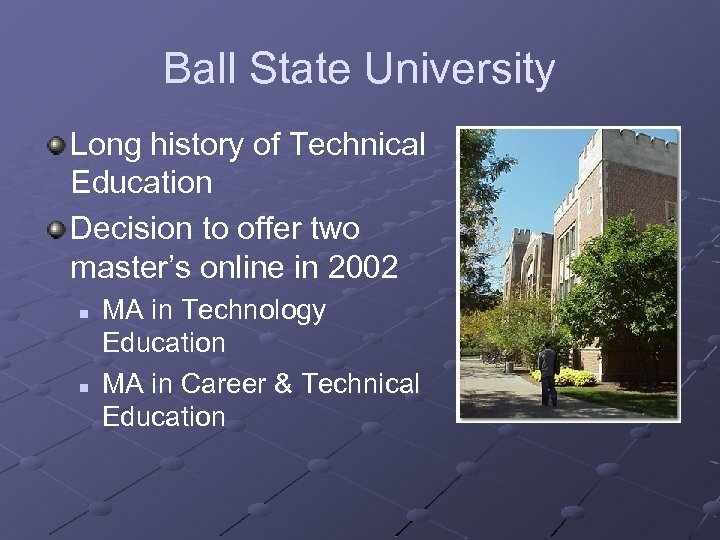 DOC n n n Majority were professors or deans. 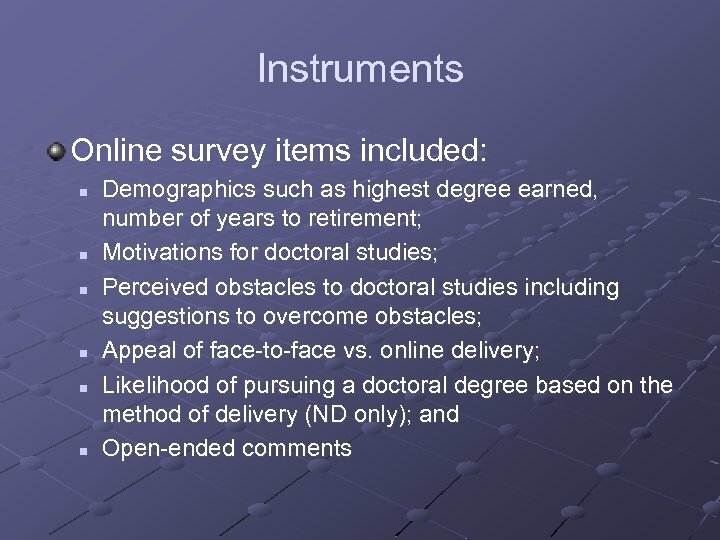 Median number of years since the doctorate was earned was 15. Median years to retirement fell between the 5 -10 and 11 -20 year ranges. Opportunity? 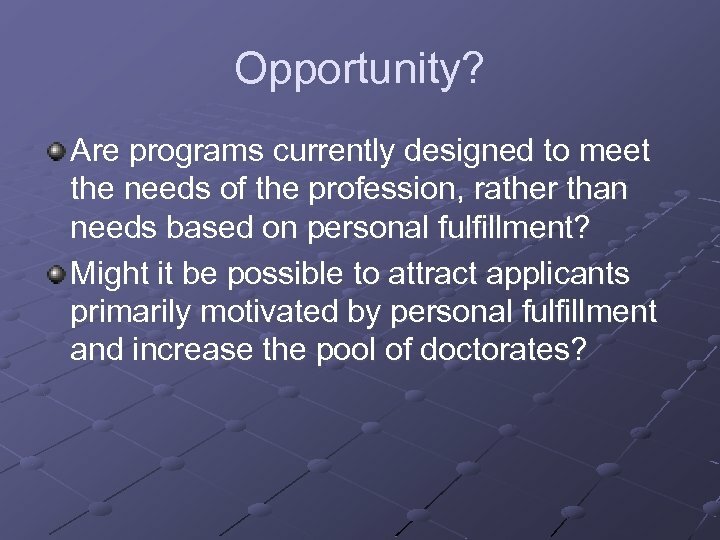 Are programs currently designed to meet the needs of the profession, rather than needs based on personal fulfillment? 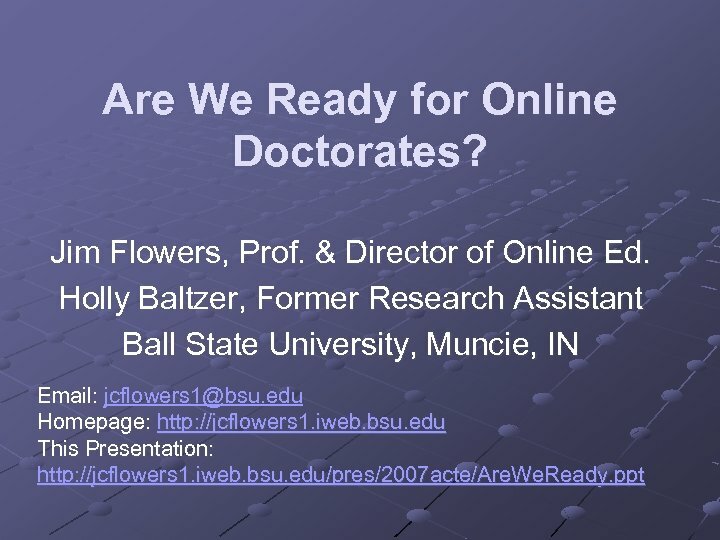 Might it be possible to attract applicants primarily motivated by personal fulfillment and increase the pool of doctorates? 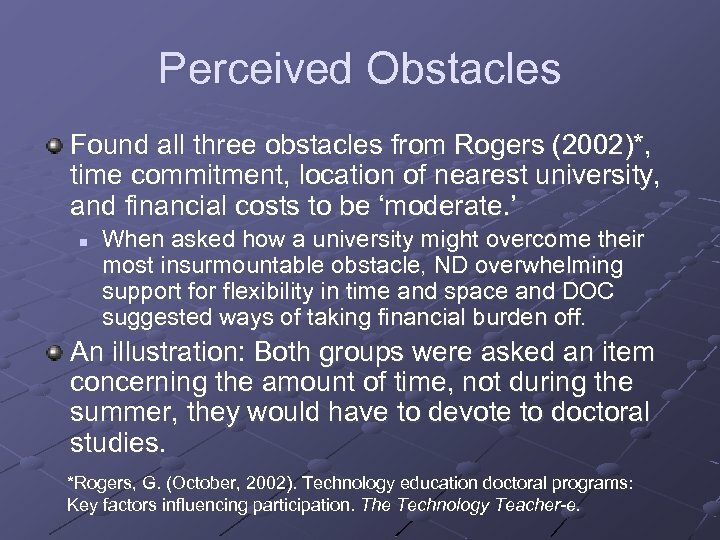 Perceived Obstacles Found all three obstacles from Rogers (2002)*, time commitment, location of nearest university, and financial costs to be ‘moderate. 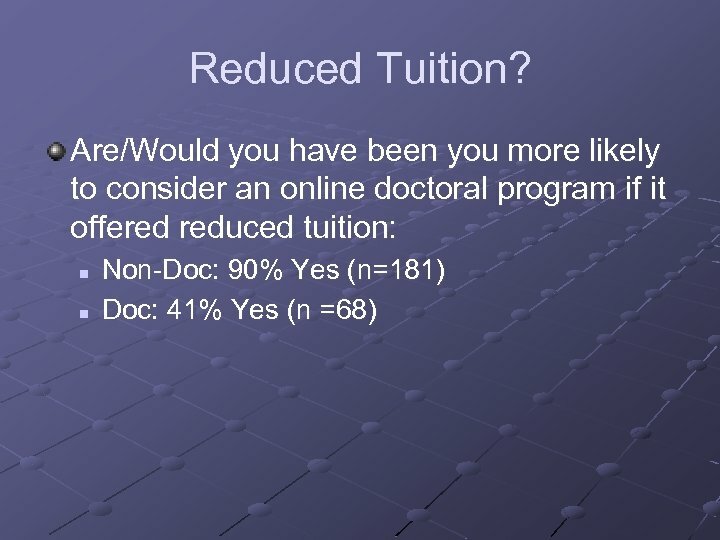 ’ n When asked how a university might overcome their most insurmountable obstacle, ND overwhelming support for flexibility in time and space and DOC suggested ways of taking financial burden off. 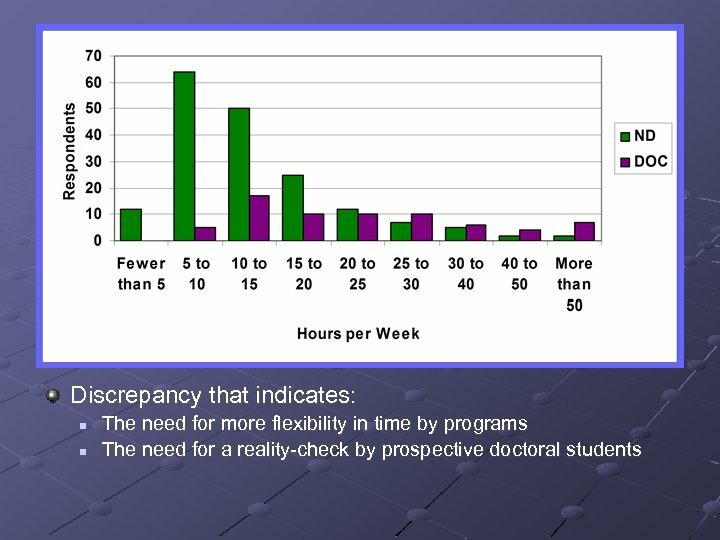 An illustration: Both groups were asked an item concerning the amount of time, not during the summer, they would have to devote to doctoral studies. *Rogers, G. (October, 2002). 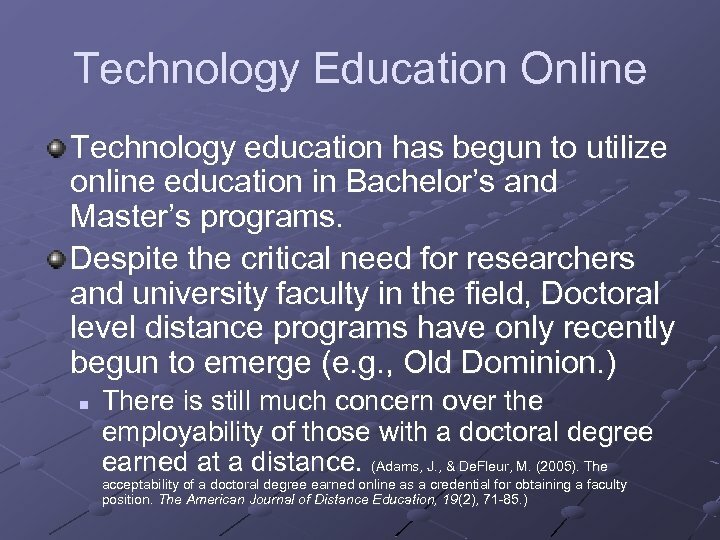 Technology education doctoral programs: Key factors influencing participation. 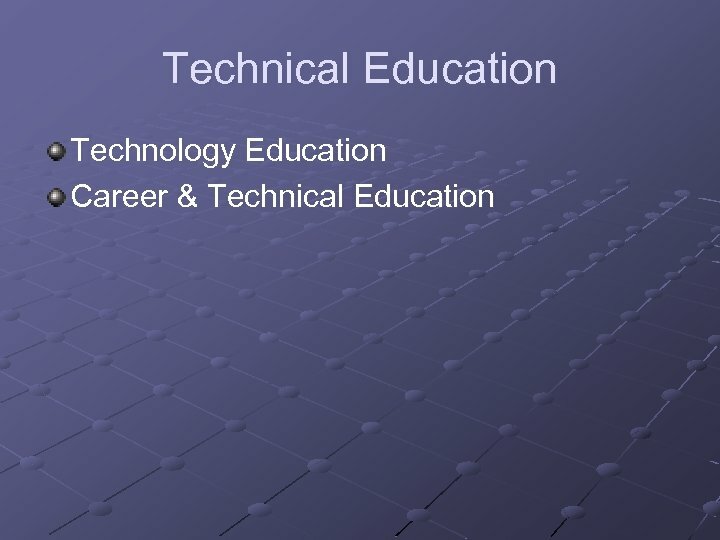 The Technology Teacher-e. 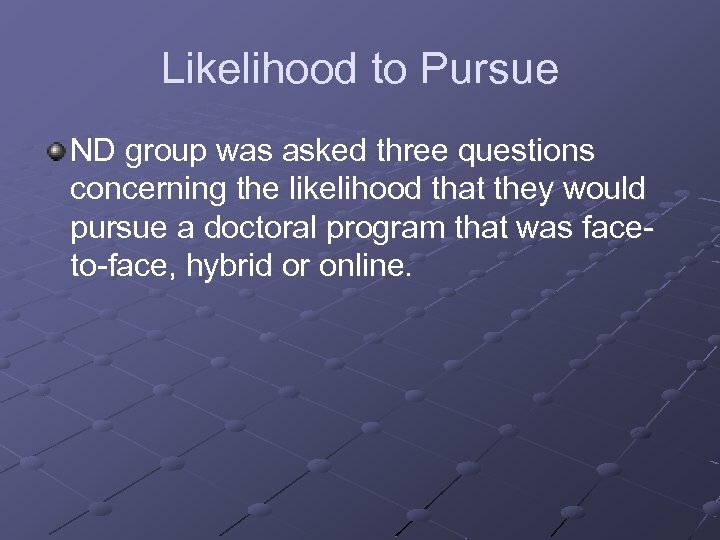 Likelihood to Pursue ND group was asked three questions concerning the likelihood that they would pursue a doctoral program that was faceto-face, hybrid or online. 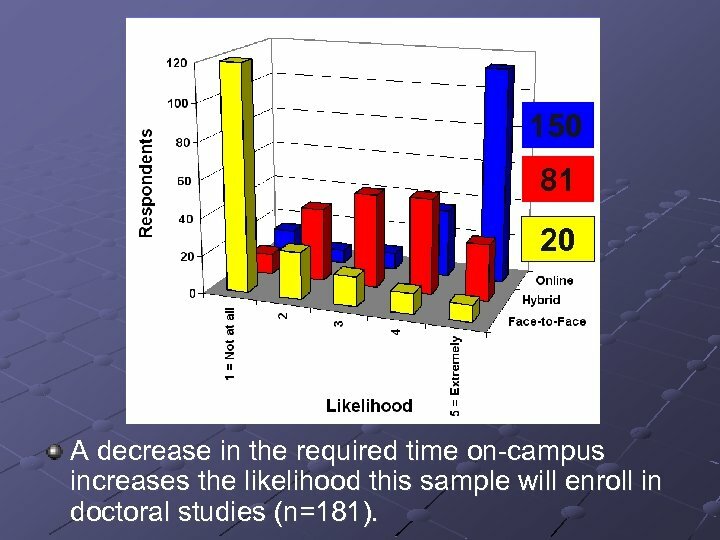 150 81 20 A decrease in the required time on-campus increases the likelihood this sample will enroll in doctoral studies (n=181). 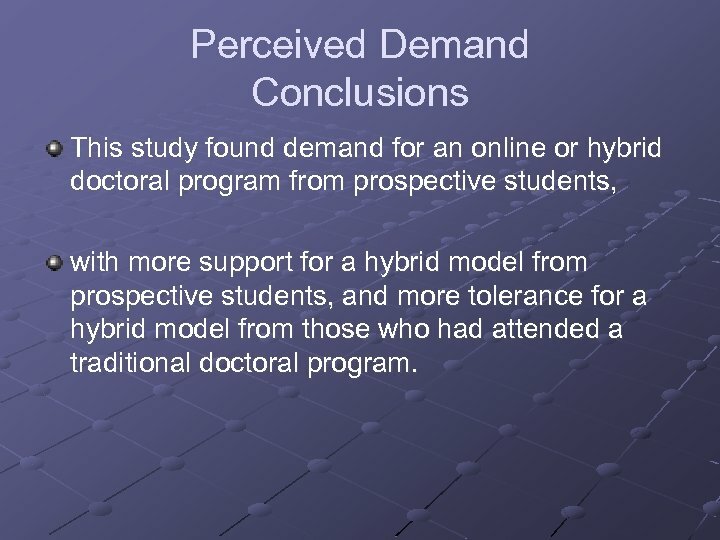 Perceived Demand Conclusions This study found demand for an online or hybrid doctoral program from prospective students, with more support for a hybrid model from prospective students, and more tolerance for a hybrid model from those who had attended a traditional doctoral program. 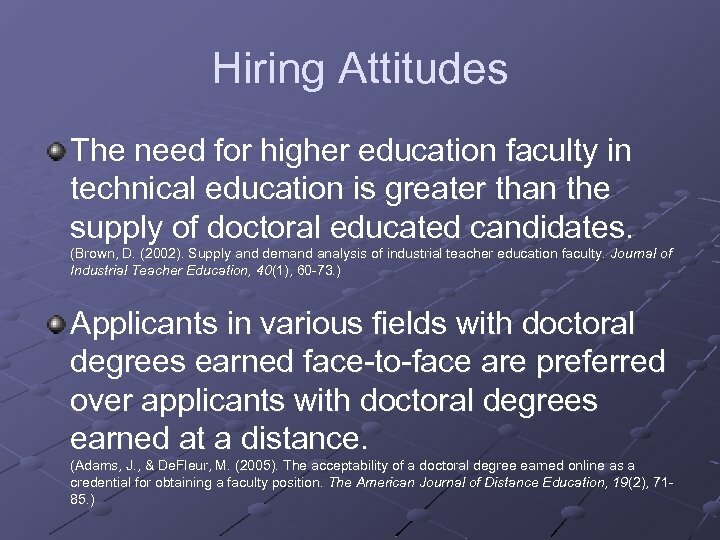 Purpose This study was aimed at determining if the stigma against those who earned their doctoral degree at a distance holds true in the field of technical education, and if so, what justifications for this stigma are given from those who make hiring decisions. 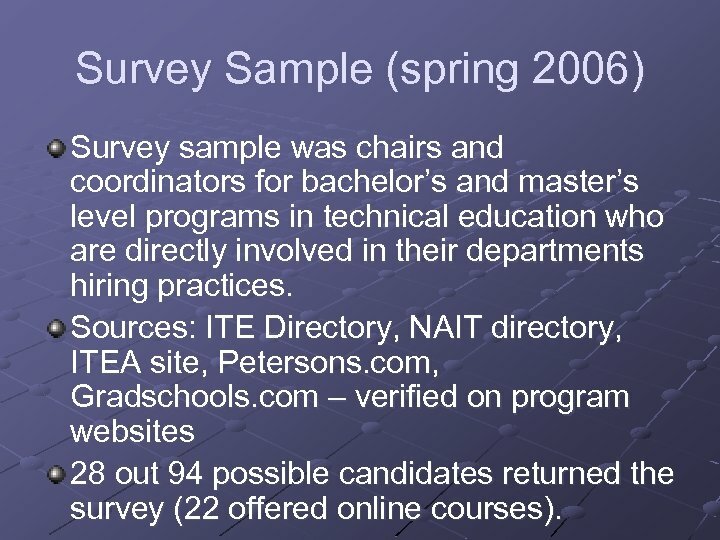 Survey Sample (spring 2006) Survey sample was chairs and coordinators for bachelor’s and master’s level programs in technical education who are directly involved in their departments hiring practices. 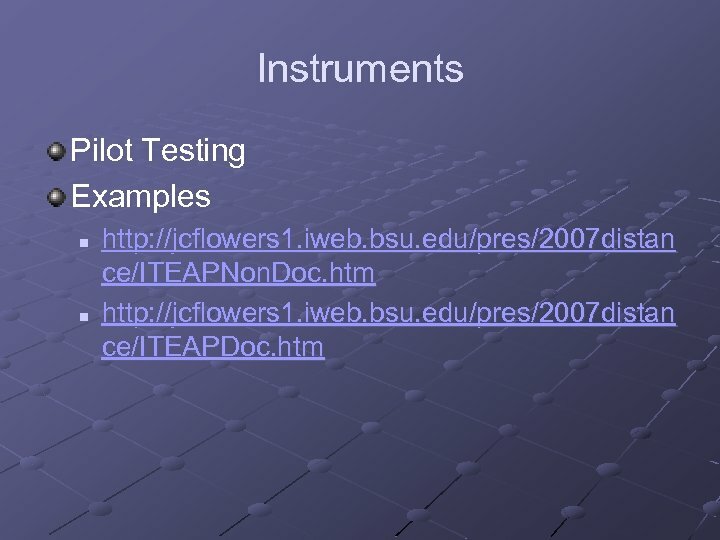 Sources: ITE Directory, NAIT directory, ITEA site, Petersons. 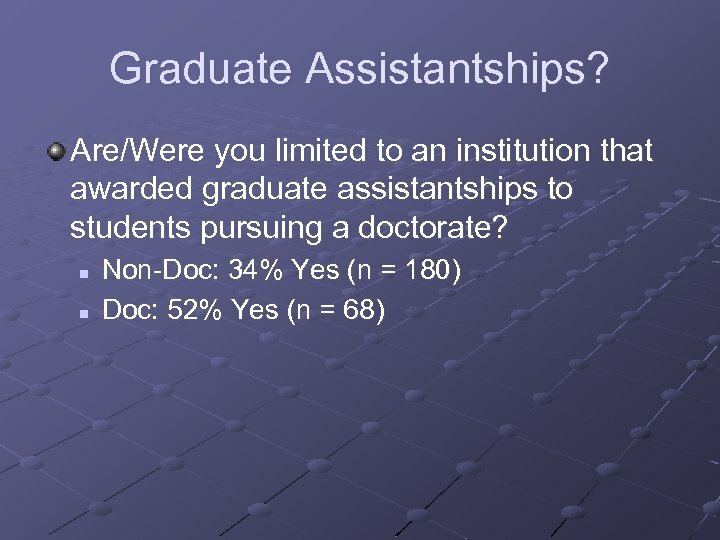 com, Gradschools. 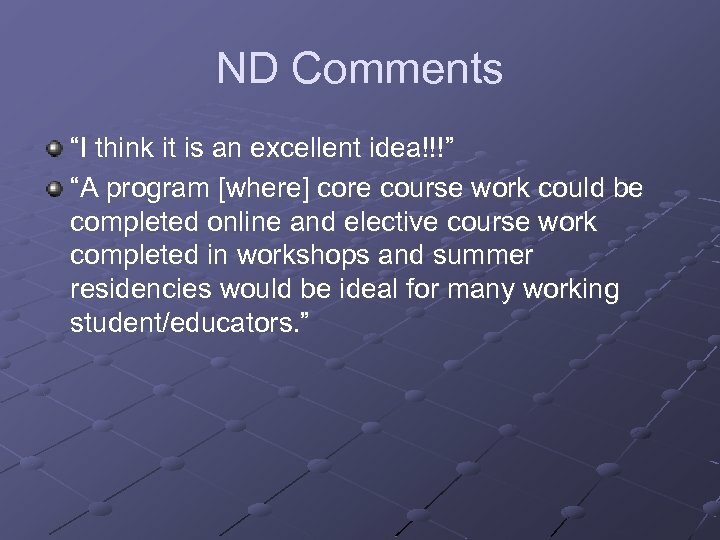 com – verified on program websites 28 out 94 possible candidates returned the survey (22 offered online courses). 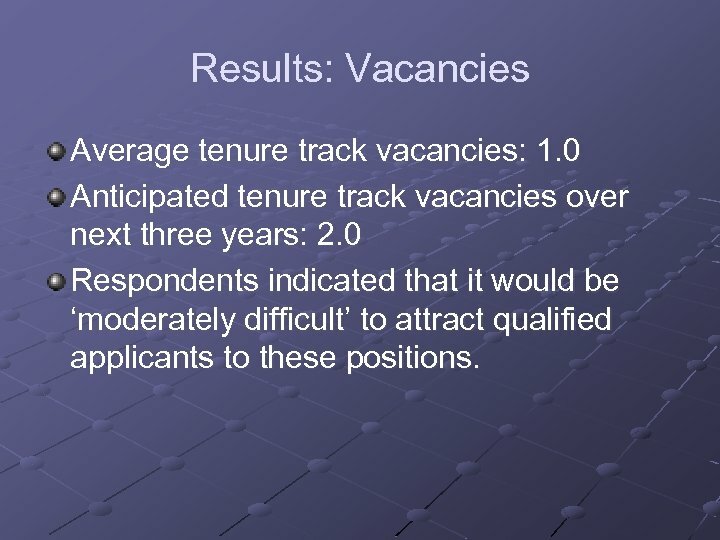 Results: Vacancies Average tenure track vacancies: 1. 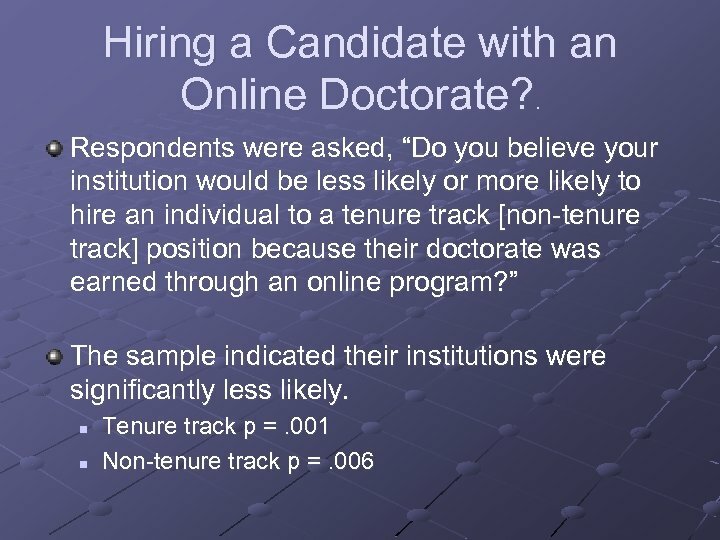 0 Anticipated tenure track vacancies over next three years: 2. 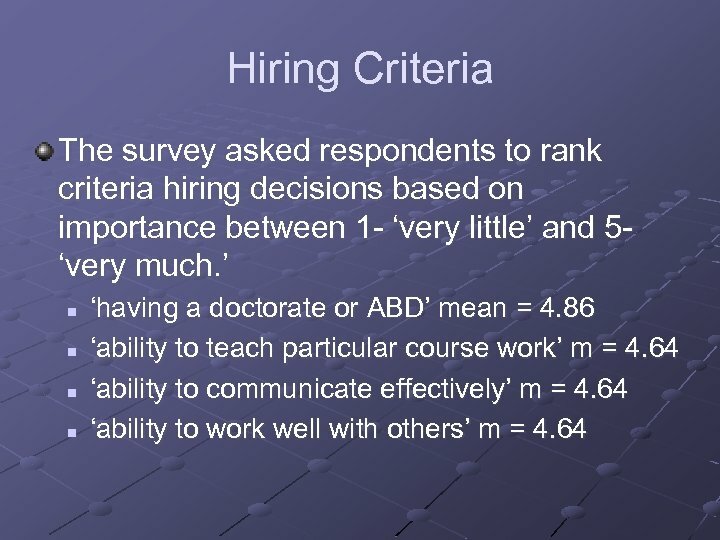 0 Respondents indicated that it would be ‘moderately difficult’ to attract qualified applicants to these positions. 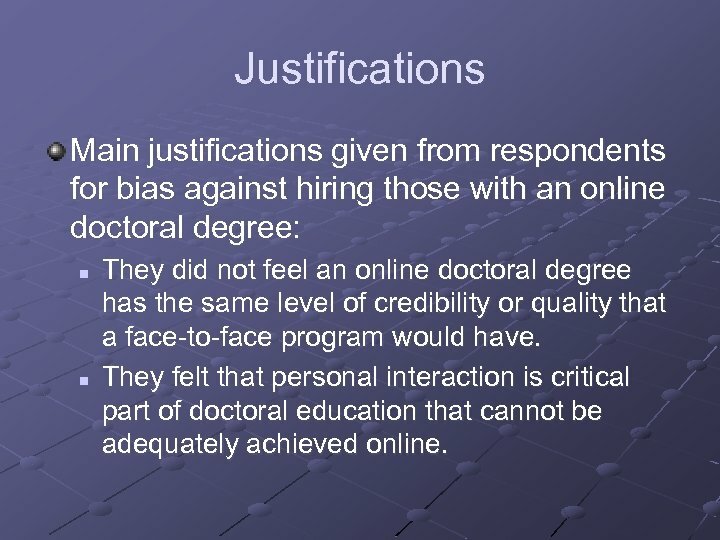 Justifications Main justifications given from respondents for bias against hiring those with an online doctoral degree: n n They did not feel an online doctoral degree has the same level of credibility or quality that a face-to-face program would have. 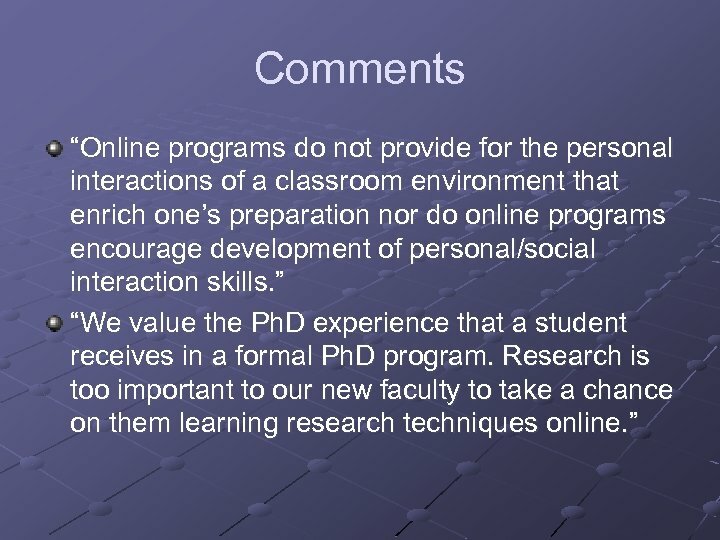 They felt that personal interaction is critical part of doctoral education that cannot be adequately achieved online. 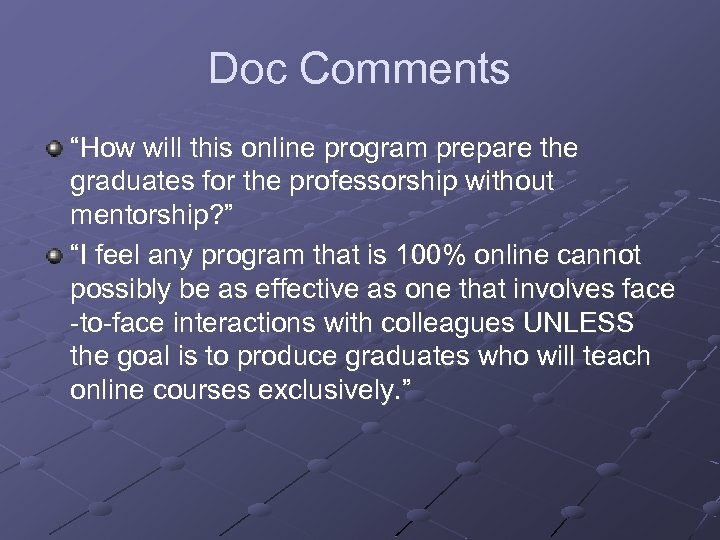 Phase 1 & 2: Conclusions There is demand from prospective students for a distance doctoral program. 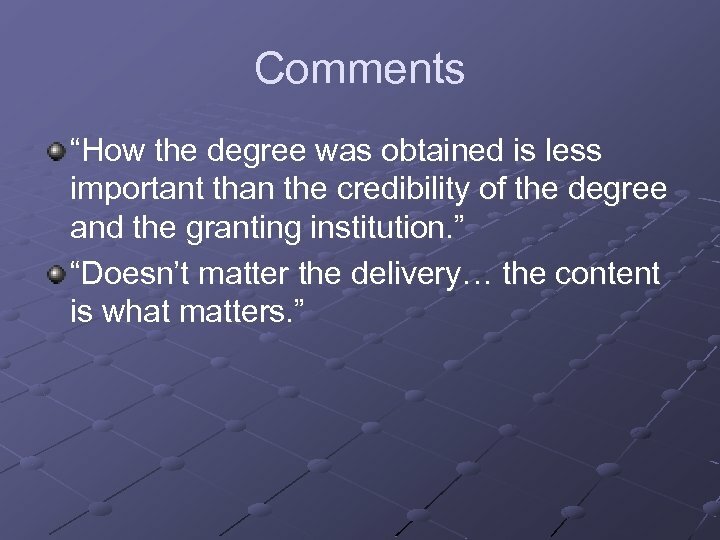 Concerns over quality must addressed to the satisfaction of potential employers if those earning such a degree are to be competitive. 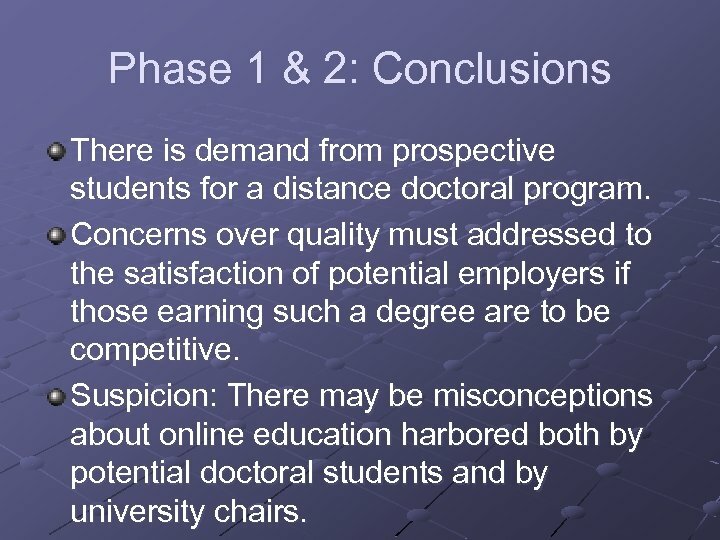 Suspicion: There may be misconceptions about online education harbored both by potential doctoral students and by university chairs. 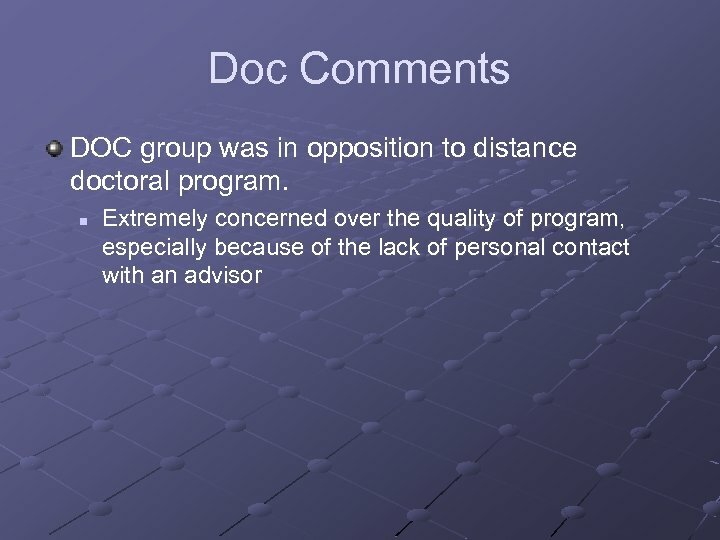 Recommendations Quality assurance of a distance doctoral program must be rigorous. 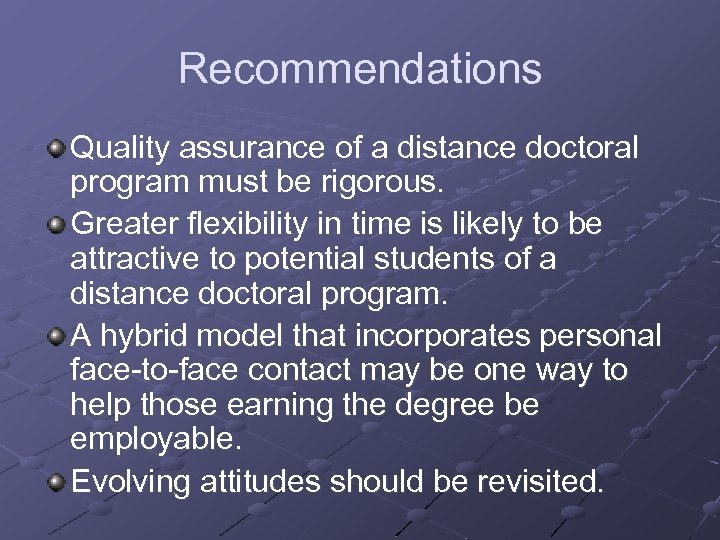 Greater flexibility in time is likely to be attractive to potential students of a distance doctoral program. 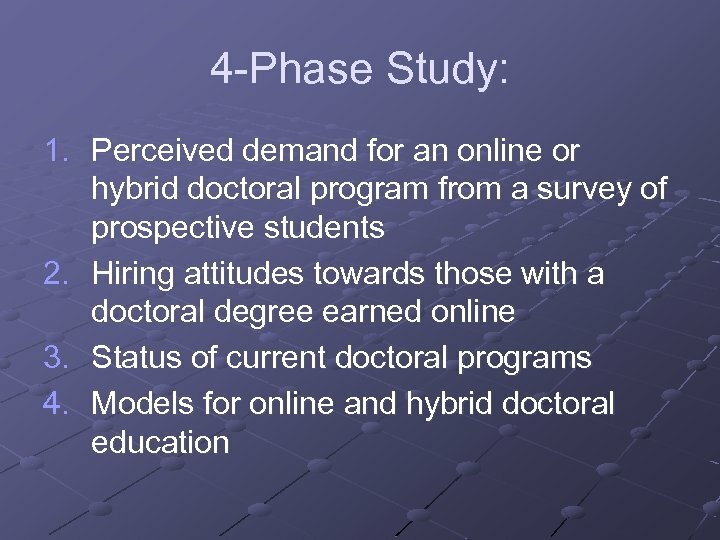 A hybrid model that incorporates personal face-to-face contact may be one way to help those earning the degree be employable. 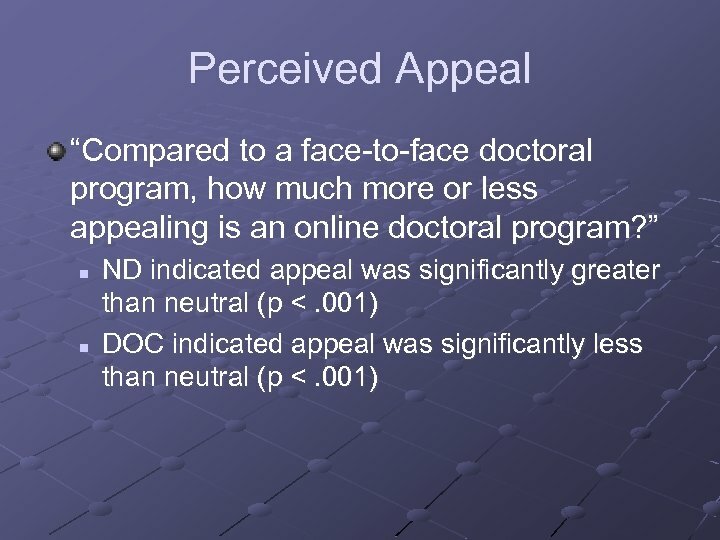 Evolving attitudes should be revisited. 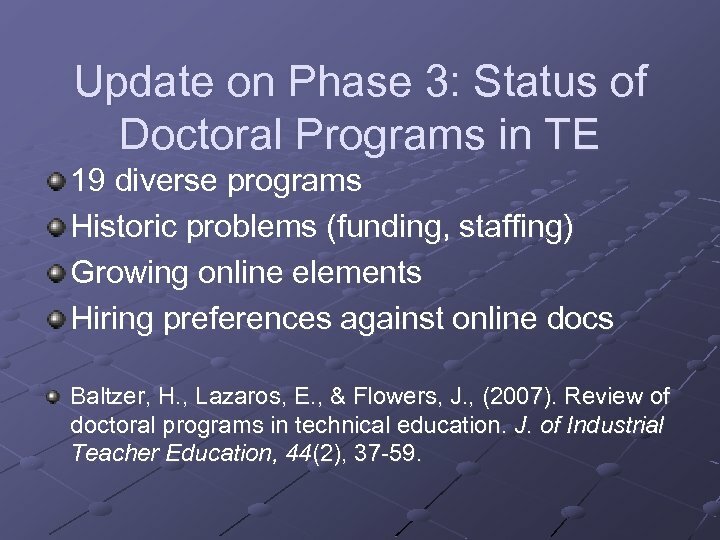 Update on Phase 3: Status of Doctoral Programs in TE 19 diverse programs Historic problems (funding, staffing) Growing online elements Hiring preferences against online docs Baltzer, H. , Lazaros, E. , & Flowers, J. , (2007). 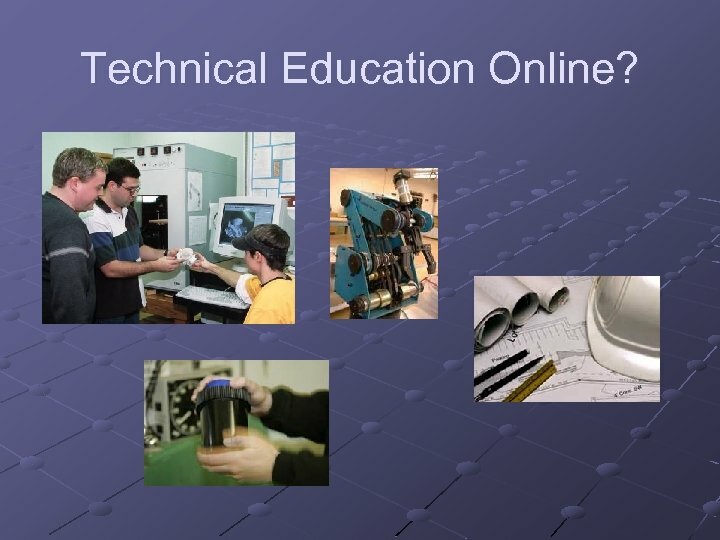 Review of doctoral programs in technical education. J. of Industrial Teacher Education, 44(2), 37 -59. What’s next? 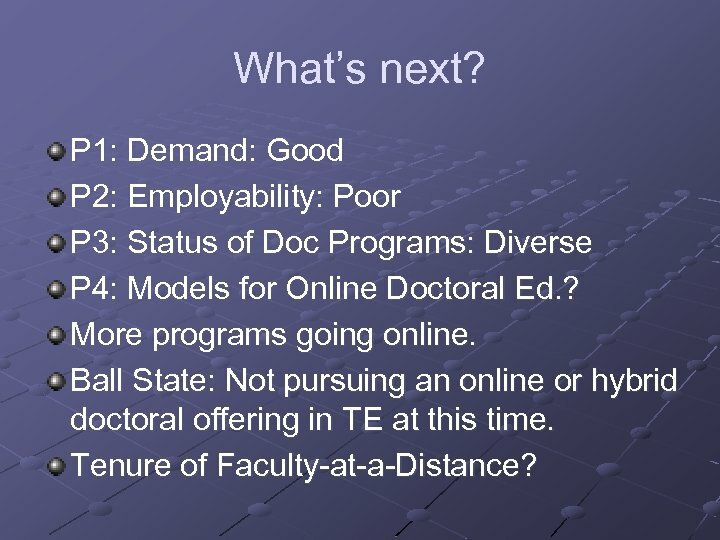 P 1: Demand: Good P 2: Employability: Poor P 3: Status of Doc Programs: Diverse P 4: Models for Online Doctoral Ed. ? 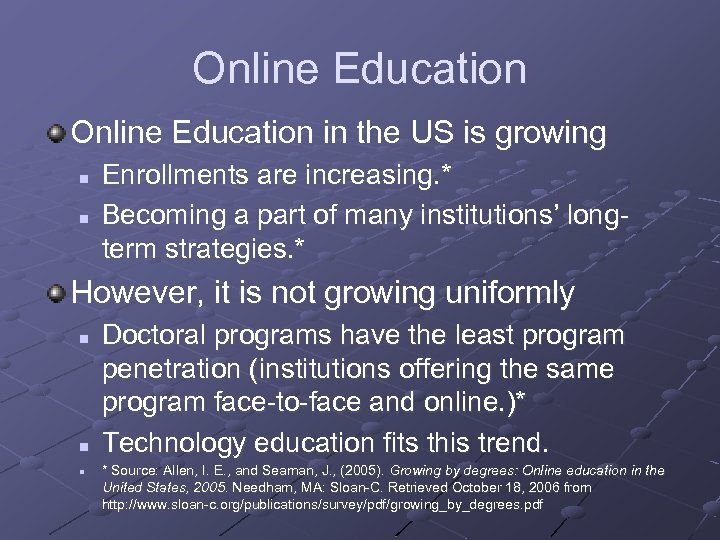 More programs going online. 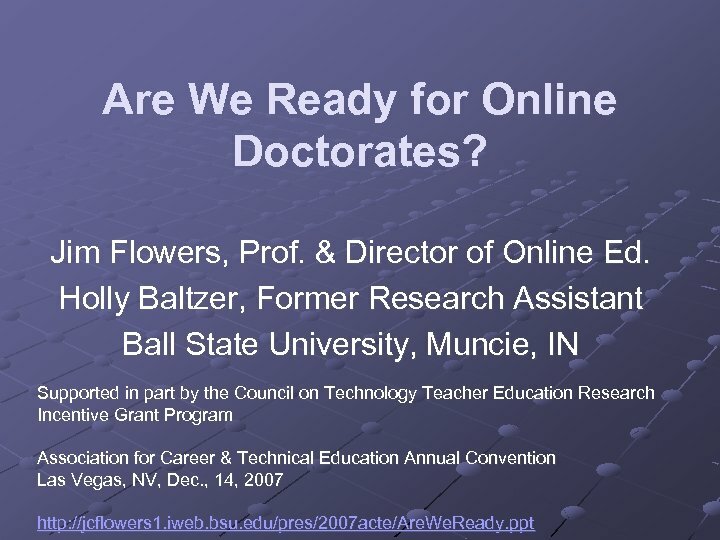 Ball State: Not pursuing an online or hybrid doctoral offering in TE at this time. 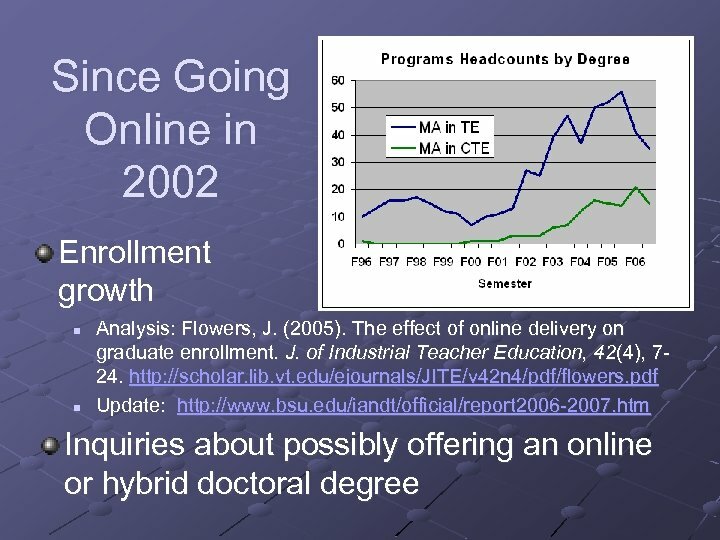 Tenure of Faculty-at-a-Distance?